Jeremy McGovern finished with 21 intercept possessions for the Eagles, the secondhighest tally ever recorded. Sydney key defenders Ted Richards and Heath Grundy had 14 and 10 intercept possessions respectively. Sydney scored 11.7.73 to 4.3.27 from intercept possessions today. This is Sydney's equalhighest result from this score source this season. The Swans have controlled the clearances 10 to three in the final term and lead 43 to 32 in this area. Kurt Tippett and Callum Sinclair have recorded nine hitouts-to-advantage compared to Nic Naitanui's seven for the Eagles. Jeremy McGovern has won 19 intercept possessions today, the equalthird highest tally ever recorded. 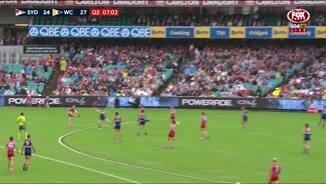 Jake Lloyd kicks Sydney's first goal from a stoppage today. Their remaining 11 goals have come via intercept possessions. The Swans lead the clearances 36 to 32 overall. 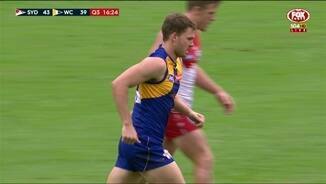 Jeremy McGovern has been resolute for the Eagles with 16 of his 19 disposals coming via an intercept possession. Ted Richards has been superb in defence for Sydney with six contested marks and eight marks in total from opposition kicks. His 12 intercept possessions is also a team high. Sydney is controlling the ball to start the final term, leading uncontested possessions 18 to nine. In the last 13 minutes of the term, the Swans outscored the Eagles 3.4.22 to 0.0.0. Over the time period, Sydney improved its ball use, going at 63 per cent by foot compared to just 50 per cent from West Coast. The Swans recorded 21 inside 50s to nine in the third term and enjoyed 66 per cent time in forward half. This included a 12 to two advantage from the 17minute mark of the term, a period in which they enjoyed 78 per cent time in forward half. In a continuing theme, all nine of Sydney's goals have come via an intercept possession. Their total of 6.4.40 from forward half intercepts is the Swans' highest tally from this score source all season. The Swans have dominated the territory battle in the third term, registering 61 per cent time in forward half and leading inside 50s 17 to nine for the quarter. 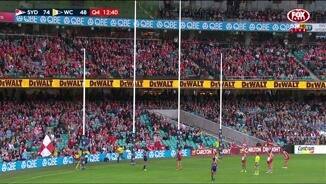 Sydney has now kicked 8.4.52 to 4.0.24 from opposition turnovers, with 5.3.33 coming from forward half intercepts. All seven of Sydney's goals have come from intercept possessions with four of them coming via forward half intercept possessions. The Swans have struggled to use the ball effectively this quarter, despite the drier conditions, going at a kicking efficiency of just 36 per cent compared to the Eagles' 58 per cent. West Coast has been efficient going forward this quarter with three goals from three inside 50s. Two of these goals have come from clearances. 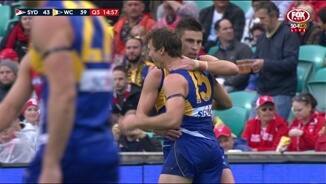 Despite trailing clearances 26 to 20, West Coast has outscored Sydney 2.2.14 to 0.5.5 from stoppages. Sydney has outscored West Coast 6.2.38 to 3.0.18 from intercept possessions today. This is despite the Eagles outscoring their opposition by a league leading 33 points per game from this score source prior to today. Luke Parker has thrived in the conditions with 13 of his 14 disposals being effective. He has also laid seven tackles and recorded five clearances. Sydney's Josh Kennedy had a strong second term in the wet conditions with 11 disposals, seven contested possessions and four clearances for the quarter. Sydney has used the ball better in the wet conditions, kicking at an efficiency of 67 per cent for the match, compared to West Coast's 53 per cent. The Swans have rested some ascendancy back in the inside 50 count, leading 18 to 12 for the quarter. The inside 50 count is tied at 31 apiece for the match. All four of Sydney's goals have come via an intercept possession. The last of them, a goal to Ted Richards came via an intercept possession in defensive 50. It was only Sydney's second inside 50 from 23 chains launched from its defensive 50 zone. The Swans lead the tackle count 16 to seven for the quarter and continue to dominate the clearances eight to one for the term. Sydney leads the clearances six to one this quarter and have a narrow edge in contested possession 22 to 18 in the second term. Swans InterchangeHarry Cunningham off due to an injury. Jeremy McGovern has five intercept possessions already this quarter for the Eagles and nine intercept possessions for the match. The Eagles have now kicked 3.0.18 from intercept possessions in the midfield zone. They have 22 intercept possessions in the midfield zone, resulting in 12 inside 50s. The Swans have 10 inside 50s from 15 intercept possessions. 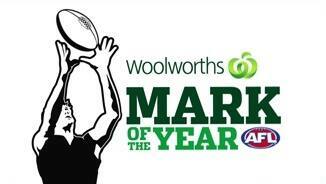 The Eagles won the territory battle in the first quarter enjoying 63 per cent time in forward half and winning the inside 50s 19 to 13. They won 14 intercept possessions in the midfield zone, resulting in eight inside 50s and two goals. This season the Swans have scored from 12 per cent of chains launched from their defensive 50, ranked fourth in the competition. Today they have launched 14 chains from defensive 50 for just one inside 50 and no scores. West Coast are winning the ball around the contest, leading contested possession 37 to 30. Matthew Priddis has a game high seven contested possessions, to go along with 10 disposals and four clearances. The Eagles are winning the territory battle enjoying 65 per cent time in forward half and leading the inside 50s 13 to 10 for the match. The Swans are staring to get on top in uncontested possessions leading 39 to 18 and are going at a disposal efficiency of 75 per cent compared to the Eagles' 60 per cent. Swans InterchangeJeremy Laidler and is possibly out for the game. In a very even contest thus far, the Swans have a comfortable lead in uncontested possession 24 to 13. Both teams have a disposal efficiency of 70 per cent. 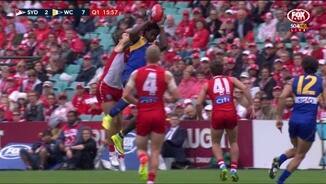 West Coast kicks the first major of the game, courtesy of an intercept possession. The Eagles average 68 points per game from this score source, ranked third in the competition. Sydney has averaged 18 more inside 50s per game than its opposition this season, ranked No.1. The Eagles have restricted their opposition to 44 inside 50s per game this season, ranked equalsecond in the competition. Sydney has been scored against from just 16 per cent of turnovers this season, the secondlowest percentage recorded by any side. West Coast has outscored its opposition by 33 points per game from intercept possessions this season, ranked No.1. The Eagles have not won at the SCG since 1999. Sydney has won its past six games at the SCG and its last five games against the Eagles at the SCG by an average of 37 points. The Swans have eon the contested possession count by an average of 15 per game this season, the secondbest differential of any side. The Eagles are third in this area, winning the contested possession count by an average of 11 per game. 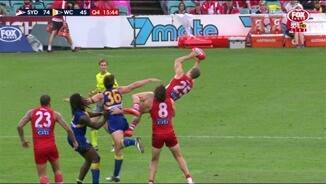 Welcome to SCG for the Sydney Swans v West Coast Eagles Round 5 clash. 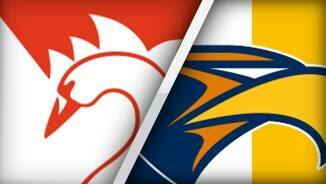 THE SYDNEY Swans have increased West Coast's road woes with a 39-point pounding of the Eagles at the SCG. In a tight slog, the Swans had the answers to every Eagles challenge and kicked the final six goals to run out 12.16 (88) to 7.7 (49) victors. Gun midfielders Luke Parker, Tom Mitchell, Dan Hannebery and Josh Kennedy led the way, while youngster Tom Papley was influential throughout and Ted Richards was one of the best on the ground. 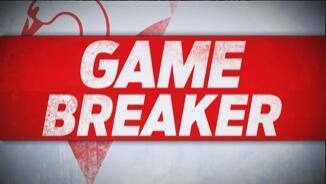 Lance Franklin booted 2.5, while co-captain Jarrad McVeigh also bobbed up with two goals. 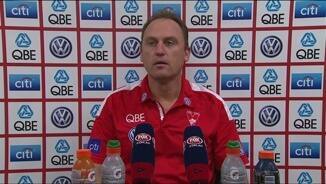 Swans coach John Longmire reserved special praise for youngster Papley after the match. "It was a good 24 hours for the small forwards across the competition, but he was really good early," he said. "He was fantastic in that first half, so lively and added some real bit all over the ground. "He was right up and about which was a real credit to him. 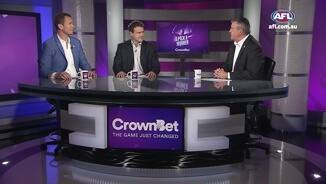 "West Coast are a good team and it was a hot game and he was right at the forefront of it." Andrew Gaff, Matt Priddis and Chris Masten battled hard in the midfield, while Josh Kennedy kicked two goals. The Eagles have now lost their past five away matches stretching back to last season. 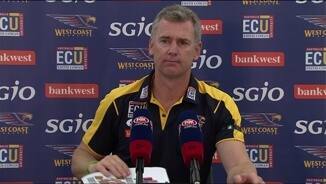 Coach Adam Simpson was left to lament his side's inability to win key contests. "We knew it was going to be an arm wrestle, we were prepared for that and I thought we did start well but critical moments really cost us," he said. "But when we responded in the third (quarter) there were three or four goals we conceded on the back of critical one on one contests and they made us pay. "I think they should have won by more to be honest. "I thought our forwards got beaten today, and there were definitely stages that we thought we could have handled better." The Eagles couldn't capitalise on a promising start. Priddis racked up 12 touches as a slicker looking Eagles side eked out a six-point lead by the first break. As the heavens opened in the second quarter, the Swans warmed to their task in pouring rain. Upping the pressure, they dominated for all but a brief period in the third quarter. The Swans led by nine at half-time, inspired by a spectacular sliding mark from Isaac Heeney and a long goal from full-back Ted Richards, his first major in 71 matches since 2013. A Franklin goal early in the third term blew their lead out to 16, but three goals in four minutes wrested the lead back for the Eagles. That was their last surge and the Swans' relentless pressure forced turnovers, with McVeigh bagging two majors as the home team opened up a 21-point buffer at the last change. First-year players George Hewett and Papley goaled early in the final term in which the visitors were outscored 3.4 to 0.1. Swans defender Jeremy Laidler copped a head knock and missed most of the match with concussion so he'll be doubtful next week, while midfielder Harry Cunningham's rolled ankle will be monitored after coming off in the second term, but playing out the second half. Both sides get an eight-day break with the Swans heading north to take on the Brisbane Lions at the Gabba next Sunday, while the Eagles head home to prepare for Collingwood at Domain Stadium.